Quite often these days, the defense industry or Homeland Security come calling on electrical engineering Associate Professor J.C. Chiao for his specialty, radio frequency identification (RFID). Think tiny, wireless, battery-free sensors able to give readings almost instantaneously. Great for military uses, perhaps weapons detection. But while Dr. Chiao welcomes all kinds of applications, he’s especially excited about RFID in the lifesaving business. “I’m convinced that RFID can achieve breakthroughs in the diagnosis and treatment of many medical conditions,” he says. It’s that reasoning that prompts Chiao to attend workshops and lectures at UT Southwestern Medical Center at Dallas. It was there almost three years ago that he listened attentively to a talk by Shou-Jiang Tang, a clinician and assistant professor of internal medicine at UT Southwestern. Dr. Tang studies the technology of examining the body’s canals, like the throat, stomach and colon. He researches gastroesophageal reflux disease (GERD), often called acid reflux, caused by stomach contents rising into the esophagus. Digestive acids can damage esophageal walls. A correlation exists between GERD and esophageal cancer. The American College of Gastroenterology estimates that 19 million people in this country alone have some degree of GERD. At the UT Southwestern lecture, Chiao heard Tang describe the way acid reflux in the esophagus is measured. The doctor inserts a wire through the anesthetized patient’s nose and down the esophagus to the stomach opening. Electrodes at the tip of the wire measure acid coming up toward the throat. “Imagine the discomfort of wired mechanisms through one’s nose—wires and electrodes that need to stay in place for 48 hours,” Chiao said. Many patients are so conscious of the device that they stop regular eating, drinking, sleeping or work activities, which skews the measurements. Mobility is also limited. Listening to the lecture, Chiao had a “eureka!” moment about the acid reflux measurement technology. Why not replace the wired system with RFID? He pitched the idea to Tang. An RFID chip receives radio transmissions, then uses that energy to retransmit information back to a receiver. Wal-Mart tracks inventory with RFID; it’s also used in smart credit cards. It has not been used with medical sensors. Not yet. 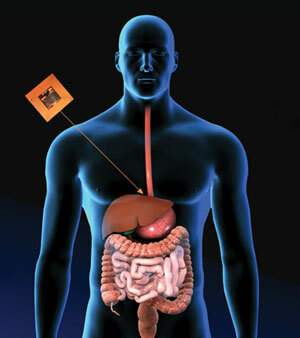 Chiao envisions pinning flexible RFID tags integrated with sensors to the esophagus, each tag smaller than a dime. When the esophageal wall scars, the tags drop into the stomach and pass through the digestive tract, or a physician can remove them. The UT Arlington/UT Southwestern RFID application has another unique quality. Instead of measuring only acidity, it measures impedances, a major refinement. Impedance measures resistance to flow of electrical current. Different materials have different ionic contents, which influence impedance. When different materials show up on the electrode, the impedance reading changes. Patients with non-acid GERD symptoms get no relief from antacid pills. An alternative treatment is required. Chiao’s device speeds the process by quickly diagnosing acid or non-acid GERD. As the sensors relay data wirelessly to a receiver outside the body, the receiver sends the data to a computer to be analyzed. The more data doctors collect, the more accurate their diagnosis. It’ll also be a snap to quickly measure the effects of treatment procedures. Patients eventually will collect their own data on an iPod-sized device worn as a necklace or on the belt. The data can be stored in a memory card to be downloaded to a computer. Back at UT Arlington, Chiao is refining the devices using swine esophagus, and there’s always more work to do, including approval for research using live animals before the first human patients sign on. Chiao also wants to make the devices even thinner, although at half a centimeter they’re small enough now to not be felt by patients. The RFID devices have cleared one significant hurdle: They’re location independent. Chiao gives much credit to his “brilliant” Ph.D. student, Thermpon Ativanichayaphong, and collaboration with Fred Tibbals, director of the Bioinstrumentation Resources Center at UT Southwestern, and Tang. The four have become good friends and often meet for lunch, which produces some highly technical conversations that one day may profoundly influence the research. Chiao, inherently conservative, believes that human tests of the devices are still a year out. Physician Tang sees human trials only a few months away. Five medical technology companies have already expressed interest in funding commercial applications. The story has been covered by NBC News, Forbes, MSN, Canada Press and other outlets. Chiao believes the results will be an eye opener. Chiao wants to do more of that blending of RFID/sensor technologies for medical purposes, starting with blocking chronic pain signals at the spinal cord using RFID implants. Experiments in rats have blocked pain signals by as much as 85 percent. He and psychology Associate Professor Yuan Bo Peng, who is also a medical doctor specializing in pain study and neuroactivities, have received a National Science Foundation grant to study pain inhibition by wireless neurostimulation. Though the electrical engineer’s RFID research endeavors have been dominated by the military, he now sees a new venue and a new direction. His research on the detection and treatment of GERD for prevention of esophageal cancer provides substantial early evidence that he’s succeeding. See Research passes media's acid test for more information on J.C. Chiao.